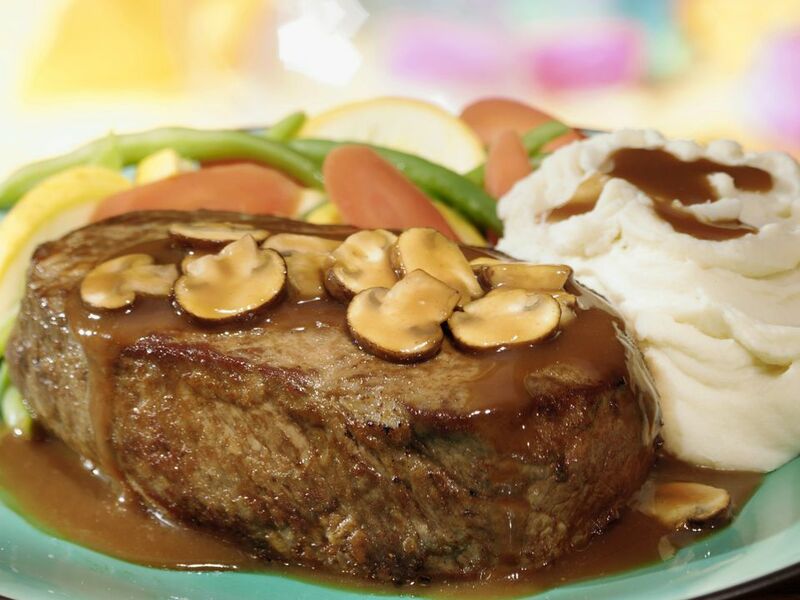 Steak Diane Recipe. © 2014 Bill Arce/Getty Images, licensed to About.com, Inc.
Steak Diane is a classic restaurant show-stopping dish of tender filet mignon steaks in a rich mushroom-herb cream sauce. With this recipe from chef John J. ​Vyhnanek, you easily can prepare this meal for a romantic dinner at home with your loved one. In a small 8- to 10-inch sauté pan, heat 1 tablespoon butter over medium heat for 1 minute. Sprinkle each side of the tenderloin steaks with a little salt and pepper. Increase heat to medium-high and sauté tenderloins exactly 2 minutes on each side. Remove them to a plate and chill in a refrigerator for 5 minutes. Heat a large (12-inch) sauté pan over medium heat for 1 minute. Add clarified butter, then add the Worcestershire sauce to the butter. Place the shallots, garlic, and mushrooms in the center and return the tenderloin steaks to the pan, placing them around the edges. With a spoon, stir and toss the mushroom mixture. After 2 minutes, add the lemon juice and season the ingredients with salt and freshly ground black pepper. Turn the filet mignon steaks and add the thyme, chopped parsley, and dry mustard. Cook the steaks to the doneness you like. Leave them in the pan and add the heavy cream and chives. Tilt the pan slightly, and pour the brandy into the front edge of the pan, turn the heat to high and let the flame (or if electric, light with a match) catch the brandy's vapors and ignite it. Swirl slightly, turn off the heat and let the flame go out. Place filet mignon medallions on plates and top with the sauce from the pan. Note: You might want to slightly undercook the filet mignon steaks prior to adding the cream and brandy so that the reduction process of making the sauce doesn't overcook them.